On a pristine west-facing hillside in the Southern Berkshire Hills, a couple hailing from Great Britain hoped to create a familiar English Tudor interior design experience in their new country home. The Berkshire setting is a close mimic of some of England’s finest rural landscapes. The property they found was a beautiful setting, with lovely elevated views facing west, above a rolling valley of farmland. With their own collection of traditional yet comfortable design ideas and treasured family heirlooms, we partnered up to create an inviting, unpretentious interior design with some contemporary elements. If there is a simpler, more inviting and casual 21st-century version of Downton Abbey, this could be it. But here, you can dress casually and settle in for one of many views. Stone, the owners easily decided, reminded them of home in England,. It would withstand harsh winters, last forever and bring character to their vision. The Tudor construction brought generous, tall windows that draw in the shifting western light. 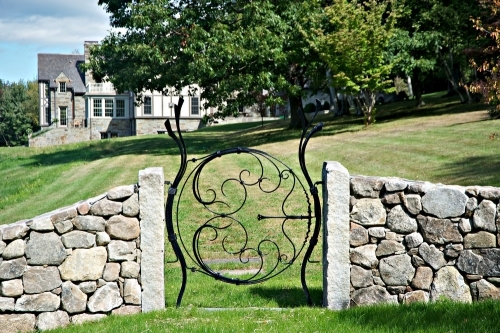 Below, sturdy stone walls mark the borders; an artful gate, designed and fabricated by a family nephew back in England, offers a welcoming invite for visitors. Inside, unassuming rooms, clean lines and cream-hued colors are backdrops for family heirlooms and some contemporary design accents. 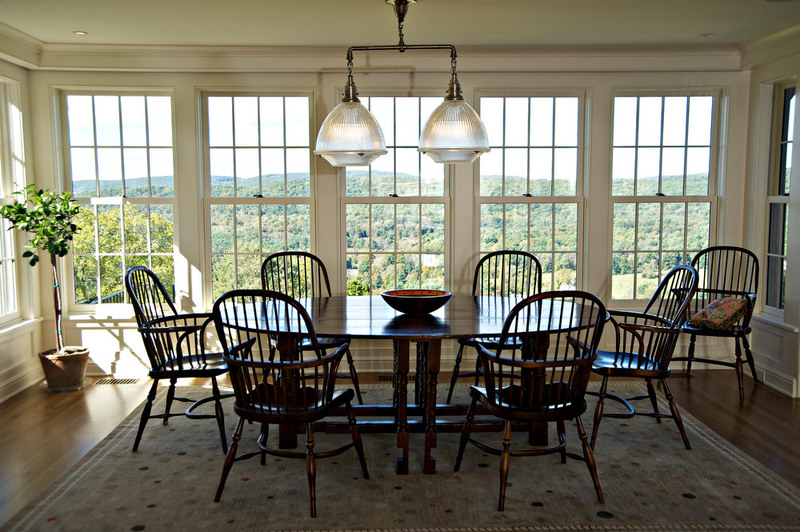 Nearly every room offers an invitation to turn off the phone, sit, stop and–perhaps for a long time–take in the Berkshire landscape. 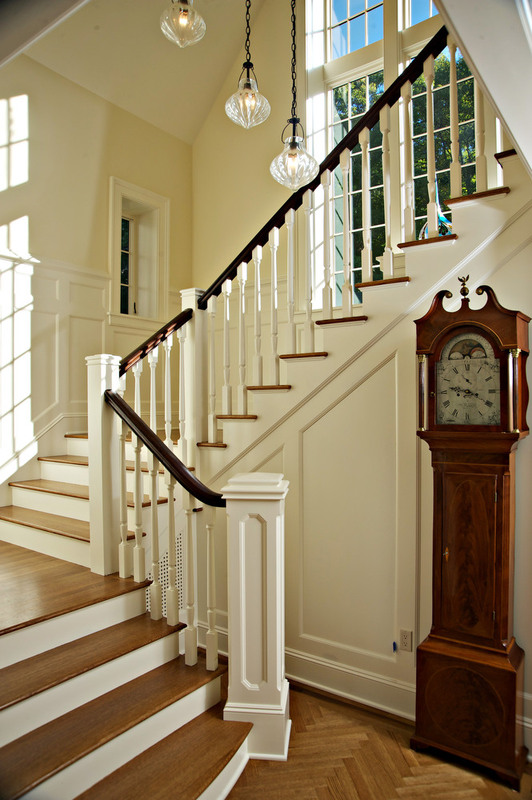 The grandfather clock is one of two in the home, and this one was “a lucky find” in their hometown back in Bristol, England. 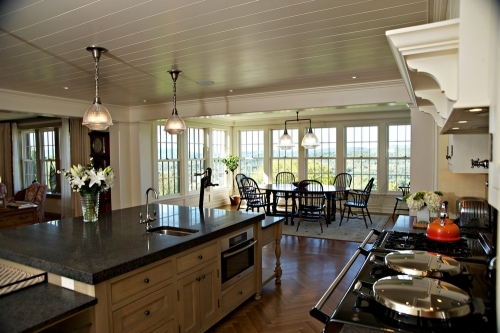 For their luxury kitchen, the homeowners selected an Aga stove (lower right), set into granite counters. The ceiling is a made of clean, tongue and groove planks. 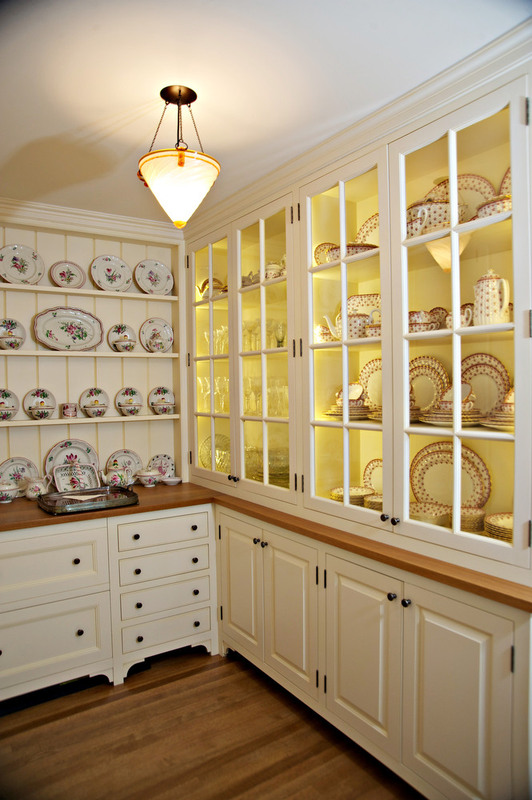 The family’s heirloom dish collection is on display in a country cupboard, with warm, interior backlighting. A living room and a smaller TV room are equally welcoming: as in other TV rooms we’ve designed, we use black to accentuate negative space around fireplaces and television, to mitigate the stark feel that arises when they are not in use. 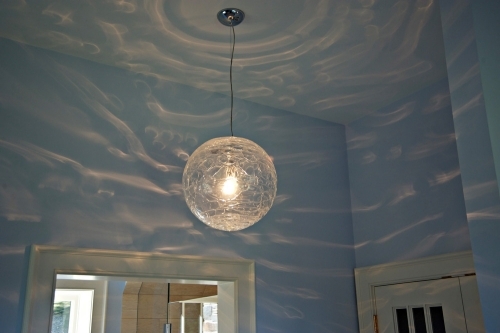 We included contemporary touches for this interior design where appropriate as well: here, this fixture by Circa Lighting brings fluid movement to the walls in the master bath. 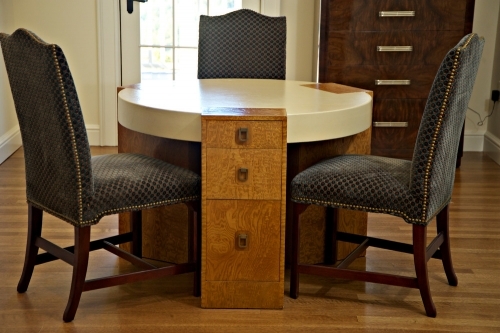 This small writing table was originally in a writing room on the Queen Mary cruise ship. It was removed when the ship was recommissioned for troop transports during World War II, and the homeowners found it in a Boston antique shop — a perfect interior design element. 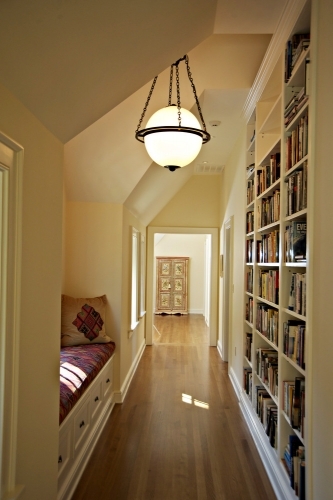 The cream-themed walls carry throughout the house, which is made even more inviting with books that have a home in most every room. The best interior designers have collaborative relationships with their clients, and these clients were excellent partners and visionaries. 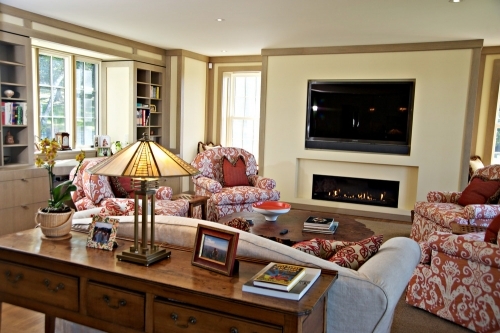 This family is comfortable in a Berkshire home that recalls their roots, across the pond. 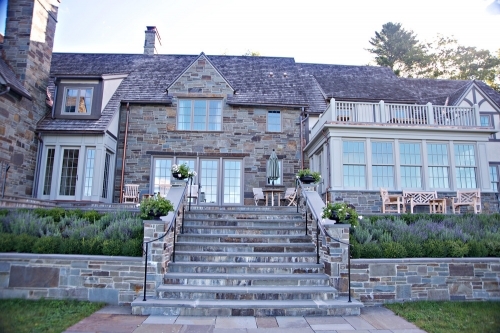 And it’s so comfortable that the Berkshire house they built as a second home is now their primary residence.